Anti-piracy organizations have come up with a wide variety of measures to combat copyright infringement over the years, with varying results. Enlisting the public to track down pirates in exchange for Bitcoin bounties is one of the more exotic ways, but according to eBook publisher Erudition, it's a great way to tackle this growing problem. And they're not alone. Snitching on copyright infringers is not a new concept, but the idea of instant cash rewards though cryptocurrency was quite novel. In theory, it’s pretty straightforward. Content producers can add a unique identifying watermark into movies, eBooks, or other digital files before they’re circulated. When these somehow leak to the public, the bounty hunters use the watermark to claim their Bitcoin, alerting the owner in the process. This helps to spot leaks early on, even on networks where automated tools don’t have access, and identify the source at the same time. Two years have passed and it looks like the idea was no fluke. Custos, the South African company that owns the technology, has various copyright holders on board and recently announced a new partnership with book publisher Erudition Digital. 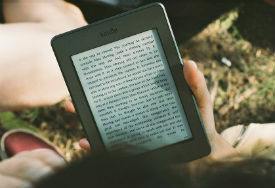 With help from anti-piracy outfit Digimarc, the companies will add identifying watermarks to eBook releases, counting on the bounty hunters to keep an eye out for leaks. These bounty hunters don’t have to be anti-piracy experts. On the contrary, pirates are more than welcome to help out. “The Custos approach is revolutionary in that it attacks the economy of piracy by targeting uploaders rather than downloaders, turning downloaders into an early detection network,” the companies announced a few days ago. Devon Weston, Director of Market Development for Digimarc Guardian, believes that this approach is the next level in anti-piracy efforts. It complements the automated detection tools that have been available in the past by providing access to hard-to-reach places. “Together, this suite of products represents the next generation in technical measures against eBook piracy,” Weston commented on the partnership. TorrentFreak reached out to Custos COO Fred Lutz to find out what progress the company has made in recent years. We were informed that they have been protecting thousands of copies every month, ranging from pre-release movie content to eBooks. At the moment the company works with a selected group of “bounty hunters,” but they plan to open the extraction tool to the public in the near future, so everyone can join in. “So far we have carefully seeded the free bounty extractor tool in relevant communities with great success. However, in the next phase, we will open the bounty hunting to the general public. We are just careful not to grow the bounty hunting community faster than the number of bounties in the wild require,” Lutz tells us. The Bitcoin bounties themselves vary in size based on the specific use case. For a movie screener, they are typically anything between $10 and $50. However, for the most sensitive content, they can be $100 or more. “We can also adjust the bounty over time based on the customer’s needs. A low-quality screener that was very sensitive prior to cinematic release does not require as large a bounty after cam-rips becomes available,” Lutz notes. Thus far, roughly 50 Bitcoin bounties have been claimed. Some of these were planted by Custos themselves, as an incentive for the bounty hunters. Not a very high number, but that doesn’t mean that it’s not working. People who receive content protected by Custos are made aware of the watermarks, which may make them think twice about sharing it. If that’s the case, then it’s having effect without any bounties being claimed. The question remains how many people will actively help to spot bounties. The success of the system largely depends on volunteers, and not all pirates are eager to rat on the people that provide free content. On the other hand, there’s also room to abuse the system. In theory, people could claim the bounties on their own eBooks and claim that they’ve lost their e-reader. That would be fraud, of course, but since the bounties are in Bitcoin this isn’t easy to prove. That brings us to the final question. What happens of a claimed bounty identifies a leaker? Custos admits that this alone isn’t enough evidence to pursue a legal case, but the measures that are taken in response are up to the copyright holders. “A claim of a bounty is never a sufficient legal proof of piracy, instead, it is an invaluable first piece of evidence on which a legal case could be built if the client so requires. Legal prosecution is definitely not always the best approach to dealing with leaks,” Lutz says.